Discovery Centre staff share real-life experience and knowledge in this overview of animal diversity and the Museum’s collections. Students engage in discussions and observations while exploring real specimens to develop an understanding of biodiversity in the natural world. This Secondary School program is tailored to suit the year level and to support the Science and Biology curriculum. The program can also be modified to include an exploration of particular animal group (e.g. birds, reptiles) or themes (e.g. marine biology). Please identify any requests for a customised program at your time of booking. Sessions conclude in the Discovery Centre with time allocated for continued student exploration. Investigate the biodiversity of the animal kingdom. 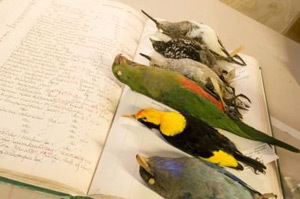 Explore museum practices such as collecting, preserving and describing specimens. Understand the relevance of collections and what can be learned from them. Conduct “fieldwork” within a contained learning environment, including classifying a group of animals. Program is modified for different year levels, to fit the curriculum. For information on booking a group into a program and additional information for your visit, go to the Queensland Museum & Sciencentre planning. Groups may be allocated time for self- guided Museum exploration during school program rotations.